A war-time anthology of columns published in the Vancouver News-Herald was the first of 41 book credits for the prolific Eric Nicol, a three-time winner of the Leacock medal for humour. The wordsmith Eric Nicol delighted, bemused and titillated readers with a prolific outpouring of light essays. Nicol, who has died, aged 91, wrote radio plays and stage comedies, gaining a national audience with 41 books, the last of these published by the nonagenarian just last year. The title carries a typical Nicol pun: Script Tease. In a seven-year span, three of Nicol’s volumes — The Roving I (1951), Shall We Join the Ladies? (1956), and Girdle Me a Globe (1958)— won Stephen Leacock Memorial Medals for Humour. A shy man who was as witty in person as on the page, he claimed not to smoke, nor drink, nor chase women — but looked forward to doing so once the royalties began rolling in. Much of his prodigious output first saw publication in newspapers, including the Vancouver Sun, the News-Herald, and, especially, The Province. By his own count, he produced more than 6,000 columns on an unforgiving daily deadline. The columns were sparked by brief news items, chance encounters on the street, or whimsies of his imagination from which he unrolled 600 perky words. Chuckles and guffaws littered the paragraphs like punctuation. A sense of humour that earned a wide audience in the 1950s could seem outdated as the decades past. He stubbornly stuck with writing as though swains pursued gorgeous but frustratingly unavailable beauties. Despite his great loyalty to the Province (he worked without a contract and refused to holiday lest editors replace him), he was dismissed from its pages in 1986 without fanfare. He deserved better. His wordplay was always clever and his dedication to the craft admirable. In his tales, he respected the virtue of his love interests, but he had his way with a sentence. Nicol’s career included a Broadway flop, an infamous literary hoax, and a conviction and fine for being in contempt of court. Eric Patrick Nicol was born on Dec. 28, 1919, at Kingston, Ont., the son of Amelia Mannock and William Nicol. Before his second birthday, he claimed in his comic memoir, he “persuaded his parents to flee a fierce winter in favour of a farmhouse” inside Vancouver’s city limits. The family lived briefly in Nelson, B.C., but soon returned to the coast and Nicol remained a Vancouver chauvinist for the remainder of his life. Days after graduating from Lord Byng High School during the Depression, Nicol’s father announced he had lost his job with a brokerage firm. He soon after left to explore the possibility of opening a motor court in England. His mother took a part-time job as a dress-shop clerk, while Eric sought to earn tips as a golf caddy. His summer earnings, as well as a modest bursary, allowed him to enter classes at the University of British Columbia. He slipped into the empty offices of the student newspaper one day to submit an anonymous contribution to a long-running satirical column called “Chang Suey,” which lampooned campus figures through the misadventures of a fictional Chinese detective. In time, his identity was discovered. A senior editor of the Ubyssey offered the student a column of his own. It was to be called “The Mummery” and the bashful writer also received a Biblical pseudonym in Jabez, Hebrew for “he who gives pain.” The column and the byline were the brainstorm of a brash, confident Yukoner by the name of Pierre Berton. Nicol was delighted by the assignment. He continued his studies in French, as well as making regular contributions to the student newspaper, even as he realized his time in the campus officers training corps would soon force him into uniform on a more permanent basis. “By 1941 it was becoming plain that the war would not be over by Christmas 1939, as I had been led to believe,” he later wrote. Having escaped hostilities, he resumed his studies at the Sorbonne after the war. A $10 fee for each column published back home afforded him a week’s dining in Paris restaurants. 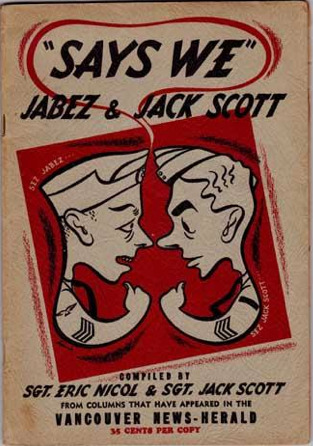 A collection of his articles was published as Twice Over Lightly by the Ryerson Press in 1947. His longtime house was owned by the United Church, somewhat restricting his more ribald wordplay. “I couldn’t get away with even a single entendre,” he complained. Back home in Vancouver, Nicol sometimes interrupted his daily yuk for a more serious examination of the events of the day. In 1954, William Gash, 19, was convicted of murder in the bludgeoning death of 45-year-old Frank Pitsch, whose body was found on the 13th fairway of a local golf course. Both men made a meagre living by hunting lost golf balls. After the conviction, Nicol wrote an allegory in which he confesses his guilt before God for his responsibility as an “unwilling accomplice” in the execution of young Gash. As a piece of writing, it was a scathing critique of capital punishment. Alas, Mr. Justice J.V. Clyne found the column to be “exaggerated and heavy handed” and, more importantly, contemptuous of the Gash jurors, who were described as being “the twelve persons who planned the murder.” The judge fined the newspaper $2,500 and Nicol $250 for contempt. As it turned out, the killer’s sentence was commuted to life imprisonment six days before his scheduled execution. More painful to Nicol was the attempt to bring to Broadway his stage play “Like Father, Like Fun,” which enjoyed success in his hometown. The effort was plagued from the start, including a need to change the title to the less memorable “A Minor Adjustment.” Meanwhile, the acerbic comic Don Rickles, whom Nicol thought perfect for his play, withdrew from the production. The plot featured a lumber baron conniving to have one of his mistresses seduce his son so as to remove from the scene the chaste but unwelcome girl next door. The comedy opened at the Brooks Atkinson Theatre on Oct. 6, 1967. It closed on Oct. 7. The unhappy experience led Nicol to write a book titled, A Scar is Born. Nor did he stop producing stage plays, including “The Fourth Monkey,” about a playwright retreating to a bucolic island, and “Pillar of Sand.” “The reviews were mixed,” he said of the latter, “bad and terrible.” Another comedy, about the crusty British Columbia newspaper proprietor Ma Murray, opened in Kamloops with the aged and ailing subject in attendance. In the midst of the opening-night production, she declared from the balcony, in a voice heard throughout the theatre, “Who are these people and what are they doing?” It brought down the house. Dickens of the Mounted was a runaway best-seller, according to the Encyclopedia of Literature in Canada, appearing on both fiction and non-fiction lists. After his long run at the Province ended without ceremony, he continued to produce books at a regular pace. 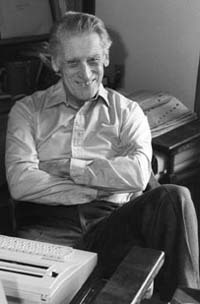 In 1995, he was named the inaugural winner of the George Woodcock Lifetime Achievement Award for an exemplary literary career in B.C. This was followed by his being invested into the Order of Canada, which recognized his using humour to address serious issues such as racism and capital punishment. He was asked once why he kept working. Mr. Nicol died on Feb. 2 in Vancouver. He leaves his second wife, Mary Razzell, and a stepdaughter, as well as a son and two daughters from his first marriage to Myrl Heselton. He also leaves a grandson. 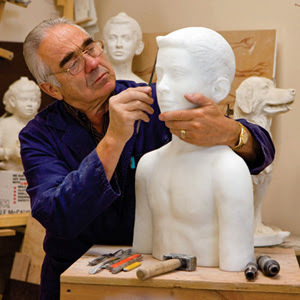 Armando Barbon at work in his Victoria studio. The Italian immigrant built a successful food distribution business before becoming a sculptor. His statues can be found throughout the capital. BELOW: The sculptor poses beside his latest creation, a bronze rendition of Dr. John Sebastian Helmcken. Globe and Mail photograph by Chad Hipolito. The doctor clutches a stethoscope in his right fist, totes a medical bag in his left. He is captured for eternity striding off to make a house call. A new bronze statue of Dr. John Sebastian Helmcken can be found a few steps from the house that bears his name. Helmcken House, built in 1852, has recently reopened after being closed nine months for renovations. Inside, one finds on display the leather medical bag from which the doctor administered medicine until his death in 1920, at the advanced age of 96. Outside, one finds a larger-than-life artistic rendition of a politician who helped usher the colony into Confederation, showing himself a shrewd negotiator by gaining promise of a railroad. The $180,000 statue was designed and produced by the sculptor Armando Barbon, a businessman whose own negotiating style involved offering the monument as a gift. Mr. Barbon came to art late in life, years after he immigrated to Canada and made a fortune with a food distribution company. He has gone from cheeses to chisels. His bronze works can be found throughout the city — a town crier greets cruise-ship passengers at Ogden Point; a female athlete welcomes visitors to the Pacific Institute for Sport Excellence; the late philanthropist Michael Williams invites passersby to join him on a bench on Wharf Street, where you can gaze upon the century-old brick warehouse he renovated to house a boutique hotel and brewpub called Swans. For many years, Mr. Barbon delivered food to the hotel, where the two men would conclude the day’s business by retiring to the pub for a libation. The sculptor was born in Treviso, north of Venice, on a vineyard that had been in his family’s hands for more than 700 years. 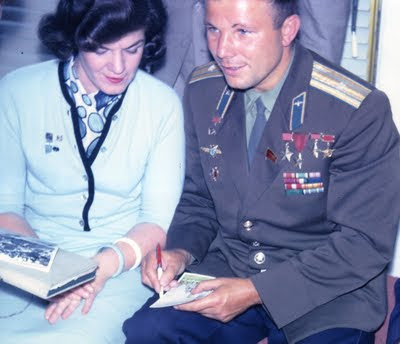 He was a boy of seven in 1944 when an American bomber, likely seeking to destroy a bridge across the Piave River about two kilometres away, dropped two large bombs on the property. After the war, he built a plumbing business before coming to Canada in 1965. His wife, Yole, and their two young children arrived about a half-year later. He studied English and earned an electrician’s certificate. Yole found work behind the counter at North Douglas Delicatessen, a storefront business the family later purchased. They imported meats and cheeses for other European immigrants. The annual delivery of grapes for winemaking was an eagerly anticipated event. In an era when even parmesan was unavailable at local grocers, Mr. Barbon decided to launch a gourmet wholesale business in 1972. He sold North Douglas Distributors to Sysco Corp. 28 years later, by which time the family firm had grown to 250 employees, a fleet of 35 refrigerated trucks, and annual sales of $47 million. On a return visit to Italy, where a sore throat cancelled plans to take voice lessons, he began studying sculpture. In Victoria, he bought a warehouse to serve as his studio, employing maestros with whom he collaborates on fashioning works in bronze and Italian marble. One of his pieces was on public display for only a brief time. It was unveiled at the entrance to Royal Athletic Park during the under-20 World Cup matches held here three years ago. It depicts two boys struggling for possession of a soccer ball. The faces on the sculpture, entitled “Battle on the Field,” are those of two of his grandsons. When the soccer tournament ended, the heavy statue was moved to the front yard of his home at his wife’s request. “I like to keep my grandsons close to me,” he quipped. He played barefoot as a boy in the old country, the price of a pair of boots too dear. Now he casts figures from British Columbia’s rich past, a doctor’s feet clad in bronze shoes, sturdy material for a march through history. Elaine Tanner became a teenaged sensation with stunning performances at the Commonwealth Games in 1966. Three years later, she would retire from her sport. ABOVE: The collection to be put up for auction. 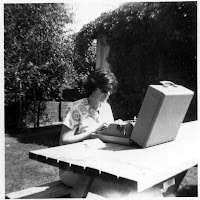 BELOW: Elaine Tanner in the pool in 1966, aged 15. INSET: The stopwatch that recorded a world record in 1966. Elaine Tanner was a pipsqueak swimmer never more fleet than when cutting through the still waters of a pool. They called her Mighty Mouse. She was still a teenager, a toothy 17-year-old, when she took with her to the 1968 Olympics in Mexico City the hopes of a nation. She remembers being still being dripping wet from a race when a reporter first asked why she had failed. That she had acquitted herself well, coming home with three medals against the world’s best, did little to ease the pain she felt after failing to win the gold anticipated by so many of her countrymen. In some ways, the hurt has never gone away. She has had bouts with depression and suffered an eating disorder. She titled her memoir, Off the Deep End. These days, she is doing fine, thanks for asking, feeling fit mentally and physically. She has also made a decision. 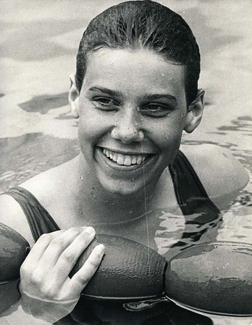 Canada’s greatest female swimmer is placing for auction her collection of memorabilia. It is a spring cleaning unlike any other. “I should have done it four decades ago,” she said Tuesday. “I know I’ll have my critics and people won’t understand. The material had been boxed in a storage locker in Ontario, where she and her husband spend part of the year. Ms. Tanner had been winnowing out clothes when she went through boxes filled with mementoes and scrapbooks. She realized the time had come to let it go. Among the items are her first bathing suit and her Red Cross beginner’s certificate; photographs with hockey star Bobby Orr, swimming sensation Mark Spitz, and Prime Minister Pierre Trudeau; assorted books, posters, and telegrams; her uniform from the 1968 Olympics; an original Roy Peterson caricature depicting her with mouse ears; and, four framed world-record certificates from her sport’s international governing body. The greatest interest will be generated by seven Commonwealth Games medals and, especially, a bronze medal and a pair of silver medals from the Mexico Olympics. The collection is to be listed by the auction house Classic Collectibles, which will conduct an online sale beginning May 23. The company, which is based in Delson, Que., south of Montreal, is best known for selling hockey items, most notably the collections of Rocket Richard and Jean Beliveau, as well as the Team Canada sweater worn by Paul Henderson when he scored his famous goal in 1972. “It’s time to give them a new home,” she said. She has donated many items over the years to charity. As well, Canada’s Sports Hall of Fame, into which she was inducted in 1971, at age 20, has an extensive collection of her juvenile medals, plaques and trophies. Ms. Tanner plans to use the auction proceeds to establish herself as a counsellor offering advice in kinesiology and holistic health. If the auction is spectacularly successful, she would also like to make donations to charities involved with homelessness and mental health. In Christmas, 2009, Ms. Tanner and her husband John Watt distributed blankets and homemade cookies to people living on the streets of downtown Victoria. As a teenager, her grin and effervescent personality captured the imagination of Canadians. She returned from the 1966 Commonwealth Games in Jamaica with four gold medals, an overnight sporting sensation. Two years later, she set an Olympic mark in the heats of the 100-metre backstroke. In the finals, she raced faster yet, only to be beaten by a half-second by Kaye Hall, of Tacoma, Wash.
Two days later, Ms. Tanner finished second in the 200 backstroke. The day after that, she claimed a bronze with fellow Canadian swimmers in the 400-metre freestyle relay. Though the teenager won three of the five medals Canada took at those games, she returned home dejected and defeated. She retired from the pool the following year. Ms. Tanner turned 60 in February. She still will not go in the pool, not even for a recreational splash. She is keeping a single memento. It is an ordinary blue ribbon, the kind awarded at country fairs and elementary school competitions. She won it at age 5 while swimming with the Lanai Club in Sunnyvale, Calif.
That little blue ribbon took her all around the globe and into the pool against the world’s best. Ms. Tanner no longer has need of her medals as keepsakes. The ribbon is staying because it represents the joy she once felt for her sport. 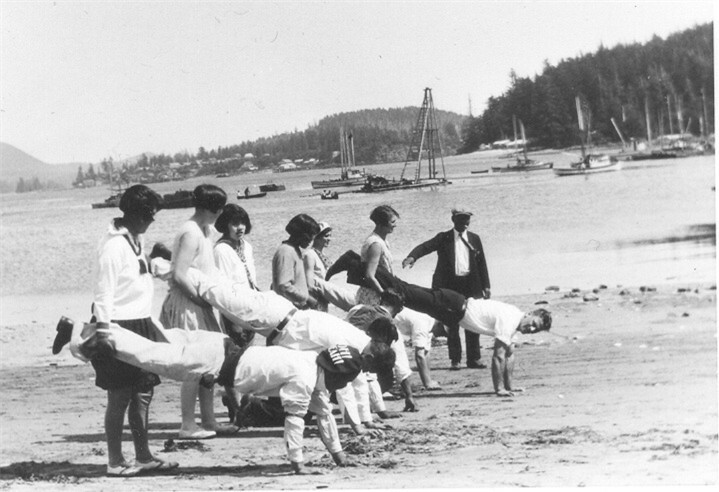 Holidayers enjoy a wheelbarrow race on the sandy beach at Stubbs Island, near Tofino. A private owner is now dedicated to returning the island to its natural state as the Clayoquot Island Preserve. Photograph courtesy the Ken Gibson Collection. Once a year, Joan Nicholson returns to her birthplace, an island off Tofino long ago home to a thriving coastal village. Mrs. Nicholson, 76, is one of the few people to have been born on Stubbs Island, a spectacular landscape of sand dunes and old-growth forest surrounded by the sea. The island was once home to a hotel, a school, a jailhouse, a beer parlour and a general store, as well as a fishing village. A post office opened 121 years ago this month to deliver mail addressed to the residents of Clayoquot, B.C. For a child, the island was a dream playground. “Beautiful beaches. Kids playing all over the place,” she said. Perhaps being on the island was treasure enough. Today, the island’s permanent population is two. Their names are Sharon Whalen and Chris Taylor, a couple who are caretakers for the owner, Susan Bloom, an apt surname for an environmentalist who cherishes what the earth provides. The island is a privately-owned paradise with magnificent gardens and century-old rhododendron trees. Every May, on the Victoria Day long weekend, the island is opened to residents of nearby Tofino, the oldest of whom will have enjoyed the island as a recreational playground in years past. Much of the Clayoquot (pronounced CLAH-kwat) Island Preserve, as it is now known, is returning to its natural state, a rainforest “smothered by the trees,” Ms. Whalen said. The island is off the grid, so the caretakers rely on solar panels to power generators, an achievement in a place as cloudy as the west coast of Vancouver Island. Water is made potable through a clever system of sand filtering. The island is home to colonies of ducks and geese. Bears and cougars swim to the island. While the caretaker was on the telephone on Sunday, a raccoon and a blue jay found shelter in her home, a temporary reprieve from the weekend’s unrelenting rain. The home in which she now lives is the same in which Joan Nicholson was born. Mrs. Nicholson’s grandfather, Walter Dawley, built a grand, three-story hotel between the wharf and the sand spit. The island, on which a trading post opened in 1855, was popular with sailors and workers all along the coast, not the least because it was a rare place where one could slake a thirst with beer. In time, he bequeathed the island to his daughter, Madeleine, and her husband, Pierre Malon. They had a daughter, Joan, born in a cabin on swampy ground, the only building still standing on the island. She can remember when cabins and wooden buildings stood in a crescent around the bay. A short walk away was a hamlet where the family names were Igarashi, Katsuro, Kimoto, Okada and Karatsu. In those days, it was known as Japtown. She can remember being with her friend Gloria Karatsu one summer day in 1942. “The two of us were walking to the approach to the wharf where the old Princess Maquinna came to pick them up. The two of us couldn’t figure out what was going on. A world war had come to an isolated island along the coast. The Japanese-Canadian families were removed from Stubbs, never to return. Joan’s family sold their property and left the island, too. The pub and hotel continued for some years. The post office finally closed in 1964. Joan never again saw her friend, Gloria, who died in 1989. She will remember her on her annual pilgrimage to the island. This year, she will be joined by Ruby Middeldorp of North Vancouver, who is Gloria’s sister. Ruby, too, was born on Stubbs Island. Her homecoming will include a visit to the site of the home in which her fisherman father, Naochi, her mother, Sen, raised a family of eight children until forced from the island. The cottage’s footprint is all that remains. It is a ghost house. Beside it, however, is a rhododendron tree, planted in a happier time by her father. It flourishes. 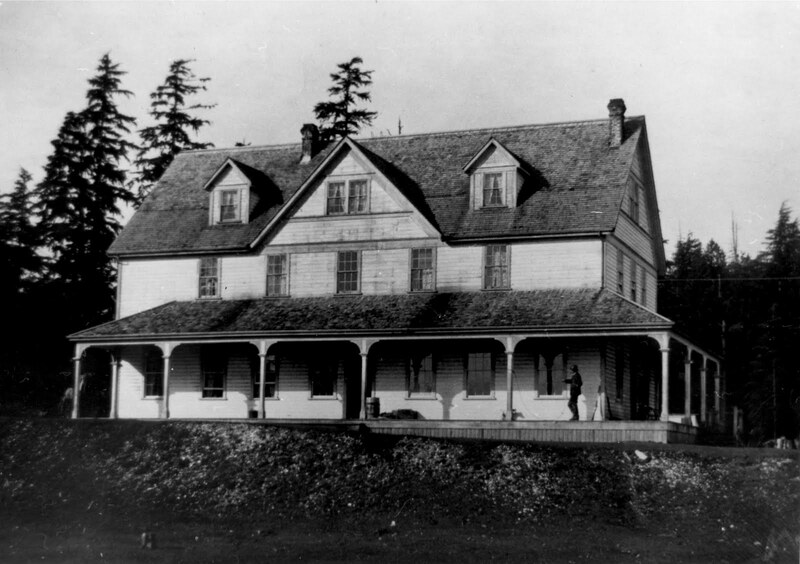 Walter Dawley built this grand hotel on Stubbs (now Calyoquot) Island. His granddaughter is returning to the island on a pilgrimage on the May long weekend. Photograph courtesy the Ken Gibson Collection. 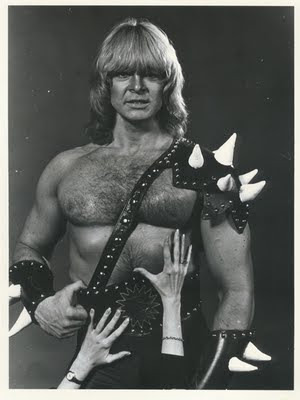 ABOVE: Thor in his 1981 heyday. BELOW: A copy of No. 1 of Thor: Rock Warrior comic. He calls himself Thor. He is mightier than a Hollywood blockbuster and more fearsome than a Vancouver Canucks power play. Thor is a rock warrior, a rock ’n’ roll nightmare, a tongue-in-cheek glam-metal thunder god. He stars in comic books, horror movies and a rock opera. When he sings with his band on stage, leather straps criss-cross his bare chest and he waves a long sword when not flexing massive biceps to play air guitar. He’s got spikes on his wrist guards, as well as on his shoulders. He is a Mad Max refugee with a heavy-metal songbook. He is what every pipsqueak 12-year-old boy dreams of becoming. He is not Thor™, the Marvel Comics superhero, nor Thor™, the protagonist of the new Kenneth Branagh movie, nor Thor, the Norse god of thunder. He is the former Jon Mikl, son of a Vancouver lumber-company executive, who crafted for himself a character worthy of a monosyllabic moniker. A show-biz wiz, he is also a deft businessman. These days, he is marketing sweaters of long defunct hockey teams. He has produced a sweater of the Portland Rosebuds featuring a red rose on the chest; the Seattle Metropolitans with barber-pole stripes of red, green and white; and, the Victoria Cougars with a turquoise body trimmed with a collar and cuffs in gold. These were displayed at the B.C. Sports Hall of Fame during last year’s Winter Olympics. His most popular sweater featured a maroon body with candy-cane stripes on the sleeve. 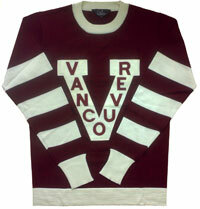 A large white V included maroon letters spelling out Vancouver. This was the sweater worn by Cyclone Taylor and his fellow Millionaires when they won the Stanley Cup for the city in 1915. Thor trademarked the name and logo before marketing a popular line of caps, T-shirts and sweaters. The Vancouver Giants junior team even wore the livery for a game. In October, Canucks Sports and Entertainment bought the rights from Thor for an undisclosed amount, a business move Thor said imbues the Canucks with the championship spirit of Cyclone. Thor spends long, lonely hours doing research on old hockey teams in darkened archives. (“Call me a geek,” he said. “I find this stuff fascinating.”) It is hard to imagine so colourful a character not being in performance. He entered his first major bodybuilding contest while still attending Eric Hamber Secondary. While the 17-year-old posed on stage, his clothes and wallet were stolen from a locker. He made his way home long after curfew wearing nothing but bikini briefs, a circumstance in which his mother did not see the humour. The following year he won his first national title as Mr. Junior Canada and his proud mother became his biggest booster. He was runner-up in 1971 for Mr. Teenage USA to Lou Ferrigno, who would go on to portray the Hulk on television. He later earned Mr. Canada and Mr. USA titles before putting down barbells to pick up a hammer and a sword. He had been performing at the Aladdin in Las Vegas when he appeared on The Merv Griffin Show in 1976, an episode including Liberace, Foster Brooks (hic! ), and the Watermelon Jug Band. 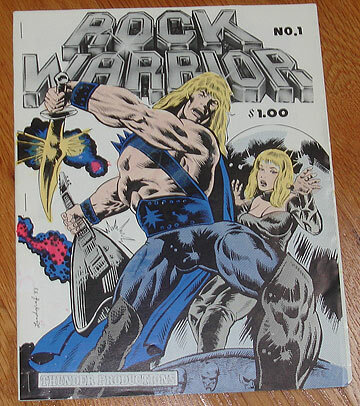 Thor waved a short-handled hammer while wearing silver go-go boots and spangled blue bikini briefs. He sang a forgettable song before performing the strongman stunt of inflating a hot-water bottle until it burst. In his later metal manifestation, he had cinder blocks broken over his chest and even bent steel in his teeth, a trick he learned from Doug Hepburn, the East Van kid born with a club foot who overcame his disability to become a world champion weightlifter. The sideshow stunts helped earn Thor recognition as one of the “Greatest 100 Frontmen of All Time” by a British music magazine. He has been performing for so long that he now entertains the daughters of his original fans. “When girls come to the show, they say, ‘Oh, my mom told me all about you. She met you’ Makes me feel a bit weird,” he said before erupting into a thunderous laugh. What’s the connection between his stage persona and his business interest? For Thor as for Millionaire hockey players, it’s all about the costume. Merv Griffin introduces Thor on his television variety show, which aired on Aug. 6, 1976. Said Griffin, "Ladies and gentlemen, one of the most talked about shows on The Strip..."
Will Millar (far left) and the Irish Rovers in 1966, a few months before they hit No. 7 on the Billboard Hot 100 with "The Unicorn." The voice is immediately recognizable, delivered in a lilt familiar from hit records and eight seasons on television variety shows. Will Millar’s tongue betrays his County Antrim roots more than a half-century after his family left Northern Ireland to seek opportunity in Canada. Back when the Beatles and psychedelia dominated the music charts, Mr. Millar and his fellow Irish Rovers cracked the Billboard Hot 100 with a whimsical song about the building of Noah’s Ark. The hit was followed by other successful albums, resulting in the launch, in 1971, of a popular eponymous show on CBC TV, a format revived a decade later for international syndication. The exposure made famous the face and voice of Mr. Millar, familiar for his red beard, workingman’s cap, and 5-foot-1 stature. A puckish stage presence was made more pronounced when he occasionally dressed in green to perform as a leprechaun. Mr. Millar left the band in 1995, retiring to a bucolic setting near Duncan, where he has, for the most part, put down the penny whistle and picked up the paint brush. His paintings offer a romantic and nostalgic view of an Ireland he acknowledges exists now mostly in memory. “The Ireland I paint and the ireland I sung about are one and the same,” he said. “We sang about fine whiskey and beautiful colleens and great Irish thoroughbred racehorses. On his last journey home to Ballymena, about 35 kilometres northwest of Belfast, he discovered to his dismay that the mill that employed four generations of Millars had been replaced by a shopping mall. His old local not only had a name change but the woman pulling pints hailed from a land beyond. 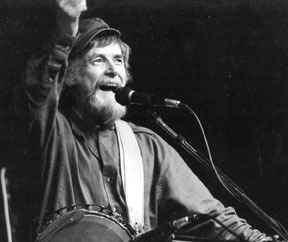 “All the old Irish tinkers that I’ve painted and sang about all my life are now Romanian gypsies,” he noted. It was not a complaint. Mr. Millar left Sunday for the old country, where a gallery in the nearby town of Ballymoney will soon begin selling his works. The irrepressible artist takes great pride in his hometown, explaining the name Ballymena is Irish for “town in the middle.” (And what of Ballymoney? “I’m not quite sure. I’m hoping it means town of money.”) Ballymena is the ancestral home of Timothy Eaton, who left Ireland to build a retail empire in his own name in his adopted Canadian homeland. It is also the birthplace of the actor Liam Neeson, whose father operated a public house a short stagger from the Millar home. “Many a time my da’ played the button accordion in Neeson’s pub,” he said. The old man’s instrument now rests in a corner of the house in Duncan. He regrets not knowing how to play it. The family, save for an older sister, emigrated to Canada when Will was 15. They settled in Toronto, where they were mentored by the family of Alan Eagleson, who later became a prominent figure in the hockey world before suffering the disgrace of pleading guilty to fraud. As a young man, Mr. Millar rejected the music of his homeland in favour of a sound he found more exotic and exciting. It is a tale he has told to Boon Collins, a writer and film director with whom he has written a script. “The Banana Boat Song” is an “Irish Billy Elliot story — the misadventures of one young boy who was mad for calypso playing steel pan band.” The freckled and red-haired Will joined West Indian musicians in the Tropitones, Toronto’s only steel pan band, which had a regular gig at the Calypso Club on Yonge Street. He even performed in Trinidad and Tobago. Only after his unlikely Caribbean adventures did Mr. Millar get invited to join the fledgling Irish Rovers. He was hosting a children’s television show in Calgary at the time. The band played the Depression coffeehouse, where Joni Mitchell also got her start, before heading to California. 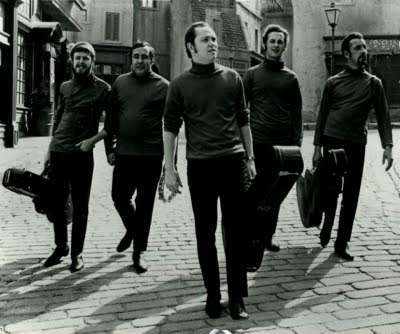 They performed at The Purple Onion in San Francisco, got signed by Decca Records and appeared in three episodes of television’s The Virginian as musical bankrobbers. The release of “The Unicorn” made them famous. At 71, he was returned to his first passion, as his mother had saved shillings to by him his first paint set as a young boy. In those days, he’d thin his oil paints by dipping his brush into the oil lamp that lit the house. Sometimes, he’d chew the end of long wooden matchstick for use as a modified paintbrush. He now lives in a century-old cottage from which he sells art cards, paintings, books, talking books, and compact discs of his recent recordings. He is literally a one-man cottage industry. Anscomb Place is a tiny cul-de-sac running off Beach Drive in Oak Bay. It is home to tidy gardens fronting five attractive bungalows. Hardly anyone knows the street, or the man after whom it is named. 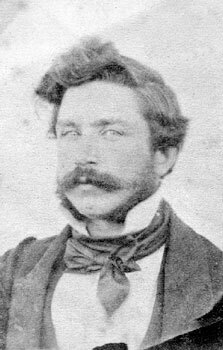 Herbert Anscomb was born in England, came to Canada at age 11, and, at age 33, was elected reeve of Oak Bay despite a dirty campaign. In those days so soon after the end of Prohibition, rivals tarred Anscomb as a brewery man. He worked for the Victoria-Phoenix Brewing Co. Ltd. As a bookkeeper. He kept the accounts, but a drop of the amber liquor was said to have never touched his lips. A few years later, a delegation appeared at his front door demanding he run for mayor of Victoria. He did so, and won again. In 1933, during the depths of the Depression, he won election to the Legislature as an independent candidate for Victoria. Anscomb subsequently contested elections as a Conservative, serving in the cabinets of Coalition government, including a stint as finance minister, during which he introduced B.C.’s first sales tax. Introducing a new sales tax is not good for the prolongation of political careers. More recently, the fallout from the harmonized sales tax led to a sudden reconfiguration of the political landscape. Premier Gordon Campbell resigned; a caucus revolt convinced the Opposition leader to do the same; both major parties engaged in simultaneous leadership campaigns. You’re watching the third act of a lengthy production when all of a sudden the curtain drops only to rise to reveal new leads. Now starring as premier: Christy Clark. Her rival: (pending as of this writing as five understudies lobby for the position). Every premier works in Victoria and every premier establishes a home here, however temporary, but they seem never to be a part of the city. The premier is British Columbia’s most prominent public servant — better known than any local member of Parliament, more powerful than any mayor. Yet, even the longest serving premiers have only a tenuous connection to the capital city. The premiers are carpetbaggers, come-from-aways whose political base is elsewhere and for whom Victoria serves as a 9-to-5, M-Th workplace. Vancouver Island politicians do not fare well on the provincial stage. Carole James, who grew up in Victoria, resurrected the NDP over two election campaigns only to succumb to her own party’s knives. Of the 11 leadership candidates vying for the leadership of the Liberals or NDP, only one, John Horgan, hailed from the island. To find the most recent premier from the island, you leaf through the pages of history past Campbell, Ujjal Dosanjh, Dan Miller, Glen Clark, Mike Harcourt, Rita Johnston, Bill Vander Zalm, Bill Bennett, Dave Barrett, and W.A.C. Bennett before stopping at Byron (Boss) Johnson, who left office 59 years ago. When we moved here in 1997, Johnson’s former home was for sale on a quiet Fernwood street, a short walk from Vic High, from which he had graduated. Johnson had success with a construction supply company started here with his brother. After losing an election, He moved to New Westminster where, in 1939, he built a large home in the Tudor Revival style in the Queen’s Park neighbourhood. He sold it shortly after becoming premier, returning to Victoria and the neighbourhoods of his boyhood. The disconnect between the Old Rockpile and the city is startling. For a capital city, it is remarkable how few modern politicians have been commemorated here. Where are the streets or public facilities named for Bennett pere or fils (a combined 31 years as premier)? We have named streets for colonial figures and Spanish explorers, for warships and survey vessels. One of our major thoroughfares is Johnson Street, but that honours a colonial figure and not Boss Johnson. After six decades, the capital deserves another Boss. Let’s put another Victorian in the premier’s office. To encourage contenders, let’s promise to rename a street after the lucky politician. I have just the road in mind. Vancouver has a Victoria Drive and Victoria has a Vancouver Street. Too confusing. Let’s rename ours. I think (Your Name Here) Street has a nice ring. A skeleton crew pulls down signs, wipes clean a whiteboard, stacks cartons of pamphlets. After the hoopla and the speeches, after the cheers and the tears, a handful of dedicated volunteers tidy up the debris of democracy. The people have spoken and 36 British Columbians are on their way to Ottawa as members of Parliament. They are tired, but triumphant. A larger group of candidates are recovering from campaign without the benefit of being victorious. “You work just as hard when you lose as you do when you win,” Patrick Hunt said on Tuesday. On election night, Mr. Hunt won the first poll reported in the riding. That was a cruel tease. Mr. Hunt is one of 165 candidates in the province who learned late on Monday night that they did not get the job. After months of shaking hands and kissing babies, of talking policy and listening to neighbours, they have concluded a chapter of their lives without the preferred ending. Mr. Hunt, a retired naval officer who is an information systems consultant, was nominated 18 months ago as the Conservative standardbearer in Victoria. The constituency, once a Conservative bedrock, sending Simon Fraser Tolmie to Ottawa six times, last went blue in 1984. Mr. Hunt faced a popular incumbent in the NDP’s Denise Savoie, who, in the end, took more than half the vote. The Conservative took almost one in four votes. Christopher Causton, the longtime mayor of Oak Bay, won just 14 per cent of the vote, suffering from his party’s national collapse. The lone scenario in which the underdog Conservative challenger could win depended on the Liberal draining votes from the NDP. The sneak attack on the right flank was not to be. “It’s disappointing. A letdown,” he said. At least he got to celebrate his party’s overall majority. The opportunity to offer one’s name to B.C. 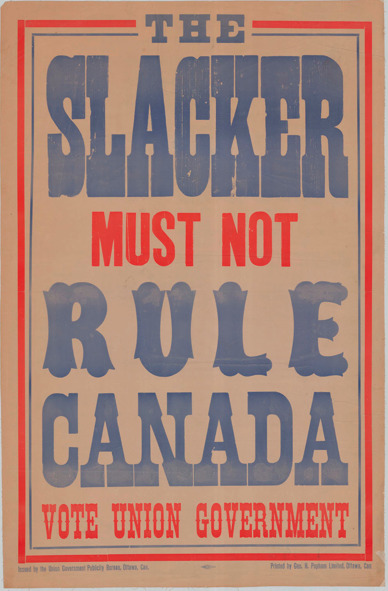 voters attracted Communists and Libertarians, Pirate Partiers and Marxist-Leninists, independents and Rhinoceroses, as well as members of the Canadian Action, Christian Heritage, Western Blocker and Progressive Canadian parties. Most knew they were longshots. Some seem to be gluttons for punishment. In Esquimalt-Juan de Fuca, Troy DeSouza, a lawyer, failed in his third attempt to win the seat. With more than 64,000 votes cast, he lost to the NDP’s Randall Garrison by just 406 votes. Three years ago, he lost by 68 votes. Mr. Hunt prefers the experience of winning an election to losing one. He won election to the Nova Scotia Legislature at age 29 in 1978. After moving to Victoria, he ran as a Reform candidate in 1993. He finished second then, too. This month’s unexpected campaign disrupted a planned two-week Caribbean holiday, during which he was to celebrate his daughter’s wedding. In the end, the family event proved too irresistible. Mr. Hunt skipped the final weekend of campaigning. To get to the wedding, he flew from Victoria to San Francisco to Houston to San Juan, Puerto Rico, and on to St. Thomas in the U.S. Virgin Islands. He had timed the arduous journey so that he could catch a ferry to Tortola, the largest of the British Virgin Islands. At the ferry terminal, though, he discovered the scheduled had been changed. Desperate, he raced to a water taxi where, for $400, he caught a ride, clearing customs to arrive just 30 minutes before the ceremony was to begin. “Felt like James Bond,” he said. The following day, he ferried back to St. Thomas, flew to San Juan and on to Chicago and then Vancouver, where he had to stay overnight. On election day, he made the short hop to Victoria, where he cast his ballot before going to the campaign office. After making his last get-out-the-vote telephone call, he went home for a quiet supper. As his sausages cooked, he prepared in his head two speeches for use later that night. He ended up giving the one he’d rather have skipped. He votes for mayor and he votes for councillors and he votes for District 63 school board trustees. Every few years, he votes to send someone to the provincial Legislature, which is not so far from his home in suburban Saanich. On Monday, he will toddle off to the neighbourhood middle school to vote for a member of Parliament to go to work in far-off Ottawa. He takes seriously his civic duty. “I never missed a vote since we got that chance,” he said. Mr. Joe, 89, does not need a vote mob or an advertising campaign to remind him to go to the polls. He does so because the law once said he could not vote. He could not exercise the full rights and responsibilities of citizenship for a simple reason. He was an “Oriental” and the white men who ran British Columbia did not recognize him as an equal. A military veteran who happened to be a loyal, taxpaying citizen, born in Victoria, was denied rights solely on the basis of his racial ancestry. You can find the sordid tale on the Elections Canada website. A later call for the franchise was dismissed as “sob stuff” and “claptrap” by A.W. Neill, a retired merchant who was the longtime independent MP for Comox-Alberni. The Scottish-born parliamentarian declared Canada to be a “white man’s country.” To the everlasting shame of his district, the supremacist was re-elected in 1940, his sixth consecutive successful campaign. 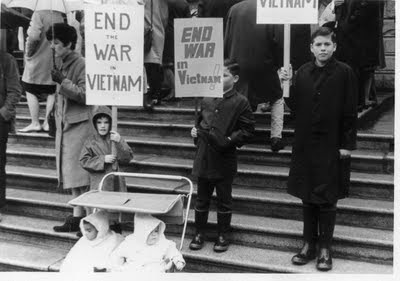 The national mood changed after the war, following the revelations of Nazi atrocities. Mr. Neill and other racialist members, including Thomas Reid, the Liberal member for New Westminster, had retired. In 1948, racial discrimination against citizens of Asian ancestry was removed as a bar to voting. (Another dozen years passed before the franchise was extended to First Nation peoples.) The transcript of the debate on June 15 took up less than a column of type in Hansard. Mr. Joe had the vote. He cast his first federal and provincial ballots the following year. He was 27. “I figured I was a veteran and we got that right and so I went and voted,” he said. Today, the federal office building at 401 Burrard St. in downtown Vancouver carries the Jung name. Mr. Jung, who died in 2002, ran as a Progressive Conservative, a party favoured by his generation as it had been the Liberals responsible for the 1923 Chinese Immigration (Exclusion) act. An earlier Conservative government had imposed the hated Head Tax on Chinese immigrants. Mr. Joe’s father, Chow Chon Wing, a merchant, paid that tax. Jon Joe grew up in a Victoria where a nickel ticket into the movie house came with an order to sit in the balcony. He was barred from enjoying the refreshing waters of Crystal Pool, a pleasure reserved for white children. In 1945, he became an artillery gunner and had just completed basic training in Manitoba when the war came to an end. He returned to Victoria, where he worked at the family’s Chinatown shoe store, the euphonious Toy Sing, on Government Street. For decades, he outfitted millworkers and loggers who worked the woods of Sooke and Metchosin. His brothers ran a grocery called B&E Food Market. Bill and Ed stuck with the alphabetical listing despite the humour of the name. Jon married the former Verna Wong, who had been raised on a farm on Cadillac Avenue, near what is now the Town and Country Shopping Centre. Verna worked at the Poodle Dog and the Coffee House, earning a reputation for making the best clubhouse sandwich in the city. On election day, the couple took their children with them to witness the act of voting. The lesson paid off. Their daughter, Charlayne Thornton-Joe, is a Victoria city councillor. She is using her Facebook page to urge everyone to vote on Monday. Ms.Thornton-Joe voted at an advance poll, so she would be available to help her father on voting day. He is still in mourning. Verna died in February, aged 86. This will be the first time in more than a half-century the couple will not be going to the polling place together.